A year ago I was experiencing a lot of shoulder pain and I knew I needed to do something about it. I didn’t have a big injury, but I just had constant dull pain in my right shoulder. The pain was presumably due to poor ergonomics at my desk, constant use of my mouse, stress, and sleeping on my right side. I also get migraines and have vertigo but I’ve figured out how to manage those problems and they weren’t the instigator for checking out acupuncture. But the shoulder pain was really affecting me because my right hand is my mousing hand and I noticed the shoulder pain all the time! At my first appointment, I expected to go in and have them put a bunch of needles in my shoulder and tell me to come back once or twice a week for a few weeks. Well, that’s not exactly what happened. I’m not going to try and explain and explain the fundamentals of Chinese medicine and things like the energy of Chi. But at a high level, all you need to know is that Chinese medicine looks at the body as a whole system and doesn’t just treat a symptom but instead investigates what in the body is causing the symptom. So back to my first appointment, what happened? Well, the acupuncture practitioner asked me about and felt my shoulder and then wanted to look at my tongue, feel my pulse in 3 spots on my wrist and arm, and hear about what I eat, how much water I drink, if I have any allergies, how I sleep and all kinds of stuff. Turns out that I have stagnation of the blood and Chi (the word for energy in Chinese medicine). What does that mean? A lot of educators compare stagnation to a traffic jam. When there’s a traffic jam, there will be traffic issues at the site of the accident but also there will be residual issues miles away. In acupuncture, stagnation is like a traffic jam. It indicates that blood and Chi is not moving properly within your body. As a result, many symptoms can occur. In my case my shoulder wasn’t able to heal on it’s own because there was a traffic jam somewhere else in my body that wasn’t allowing my body to give my shoulder what it needed. So during my first session, I did have needles placed in my shoulder but I also had them placed all over my body — in my ankles, toes, knees, wrists, collar bone area, temple, and head. Why? Well, it’s because acupuncture treats the body as a whole system. The acupuncture practitioner placed in all those areas away from my shoulder because those spots would help alleviate the traffic jam and help the blood and Chi that was needed to reach my shoulder in order to heal it. For example, after the acupuncture practitioner took the needle out of my collar bone area, she mentioned how it was definitely going to bruise and how she’d only seen that a handful of times in her career. I was a little worried and when I asked her what that indicated I think she said that the point (or meridian) on the collar bone was connected to the kidneys and that I had some type of stagnation (Chi I think) in my kidneys. Kind of crazy but also pretty cool! Here’s a great little video explaining this whole concept of stagnation through the analogy of a traffic jam. After receiving acupuncture treatments for about twice a week for 10 weeks, I noticed a considerable difference in my shoulder pain. But I also experienced improvements that I didn’t expect as well. For example, I rarely get a migraine headache anymore! I also notice that the “fight or flight” response that I used to get when I was stressed isn’t as prominent. In other words, I don’t get stressed out as easily. And if something stressful happens, I don’t hold onto that stress in my shoulders. Yay!!! 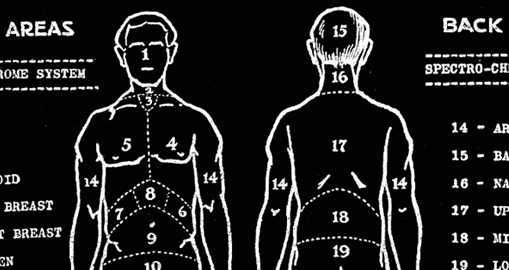 This all made me realize some good user experience lessons from acupuncture. User experience is about the whole system. For example, if you are a commerce product you can’t just focus on your website because you’re missing out on half of the experience. What is the experience for someone when they receive a product from you? How thoughtful and easy is the packaging ? Is the packaging slip a boring looking thing that looks like a spreadsheet or does it evoke your brand and story? Does your content and conversation on social media engage and excite your customers? When things aren’t working how we wish they would, we often immediately try to fix one specific page or area. But, we have to look at the system as a whole. Consider a scenario where you’re noticing that you have a huge bounce rate on your homepage. A lot of teams would go into redesign mode and spend countless hours coming up with new versions of the homepage. But, perhaps your homepage is designed and functions really well, maybe it’s not the problem. Instead, did you consider that maybe it’s not the page, maybe you’re attracting the wrong people to your site to begin with? As a user experience designer, you have to consider that the site of the problem (e.g. the traffic jam) might only be a symptom of a larger problem somewhere else. To be able to identify where that problem might be, you really have to work to understand the system and not just the website. I think this is why I love user experience design so much because it requires you to think at the overlap of design, technology, and business. So today if you’re trying to solve a problem with your product, try to think about the system as a whole and what points within the system could be the cause of the symptoms you’re seeing within your experience. PS: I realize that I may have messed up or misrepresented some of the clinical terminology when it comes to acupuncture and Chinese medicine. My apologies to anyone who is a practitioner or in the field!